The Horticultural Science Small Fruit Programs are focused on optimizing production of bunch grapes, muscadines, strawberries, blackberries, raspberries and blueberries. Breeding programs are active in developing varieties of strawberry, blueberry, muscadine, raspberry and blackberry adapted to North Carolina. Cultural studies focus on the development of management practices that improve yield and fruit quality. The research and extension information is posted to several commodity specific portals that act as “one stop shops” for information on a specific crop. The Small Fruit Program’s collaborative effort unites regional growers, grower organizations and industries through agriculture extension programs and research stations. 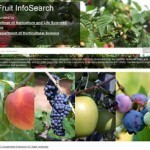 Find answers to all your fruit related questions with our fruit crop search engine. This powerful tool queries all fruit related content on NC State University repositories, archives, scientific literature, magazines and websites. The Blueberry portal unifies research information and resources pertaining to the production techniques, management, and marketing of North Carolina blueberries that growers need for success. Growers and Extension agents will find information specific to raspberries and blackberries for new and experienced growers. The site feature articles sharing grower experiences, industry representatives and national research initiatives that include NC State personnel. The Muscadine Grape site is developed to centralize the latest information and research for North Carolina growers, addressing production issues, pest management, marketing and popular cultivars. The Strawberry Information Portal consolidates knowledge from interdepartmental, multidisciplinary approach to save growers time and effort seeking strawberry specific research, production, and marketing information.